I don’t like making messes. It’s weird, because as an artist, you’d think I’d be comfortable with dirt and such, but I’m not. What I hate most of all is clutter. I can let dust pile on most of the house, but I can’t stand a pile of mail or crap all over the counter tops. So it will come as no surprise to those of you who know me, that I hate moving things around in the house. Steve loves moving furniture and is always thinking of ways we can rearrange rooms. My philosophy is that when things are in order, they should be left there. I have lightened up quite a bit since we married, but I mostly want to leave well enough alone. It’s funny that our latest project involves messing up the house, moving furniture and creating chaos. What’s even funnier is that I’m the one who initiated it. About a month ago, I met my second cousin, Marcia, for coffee. As we talked about all the family members we’d loved and lost, she mentioned a breakfront (or hutch as I call it) that had been in her parents’ house. I remembered the piece and commented on how cool I thought it was. Since it was in storage and nobody in the family had room for it, Marcia thought it should go to us and suggested I call her younger brother Carl to see what he thought. Long story short: Carl was willing to part with it and Steve and I will pick it up tomorrow. That leads me to the mess. Getting a new piece of furniture means moving old pieces to make room. I emptied our buffet and suggested to Steve that we move it to the corner and put our stereo equipment on it (a suggested he’d had in the past but I wasn’t willing to do at the time). Monday night we tackled the dining room and started planning. Tomorrow we pick up the hutch and will get everything put back together this weekend. What makes this story so interesting (to me anyway) is that I’ve been forced to live in a mess all week. Yes, it’s making me nuts, but I’m excited about the final outcome. 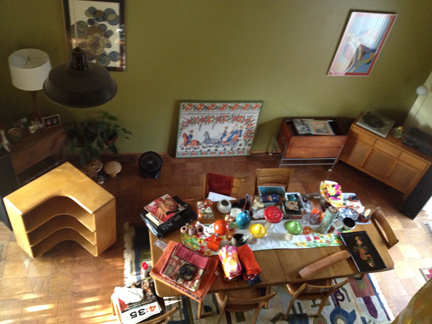 I’ll be sure to post photos of the finished room, but in the meantime, you can enjoy a rare glimpse of my messy house. I seem to recall that when you were younger I had to threaten to have Nana come over in order to get you and your sister to clean your rooms and the play room. How times have changed!